Harrison would later appear in several low-budget ninja warrior features in his acting career, according to his IMDB profile. According to details from the July 18, 1960 issue of Billboard Magazine, Italian actress/model Anna Ranalli was crowned “Miss Europe.” “The Medusa against the Son of Hercules” was one of six feature films that she appeared in throughout her brief acting stint (according to IMDB). Antonio Molino Rojo later appeared in Sergio Leone’s “The Good, the Bad and the Ugly” (1966, in the role of Capt. Harper, Rojo was credited as Molino Rocho in Leone’s classic western). The North American distribution of the English-dubbed version of “The Medusa against the Son of Hercules” was handled by Joseph E. Levine and his art-house/independent film distribution company, Embassy Pictures for first-run television syndication (according to IMDB). 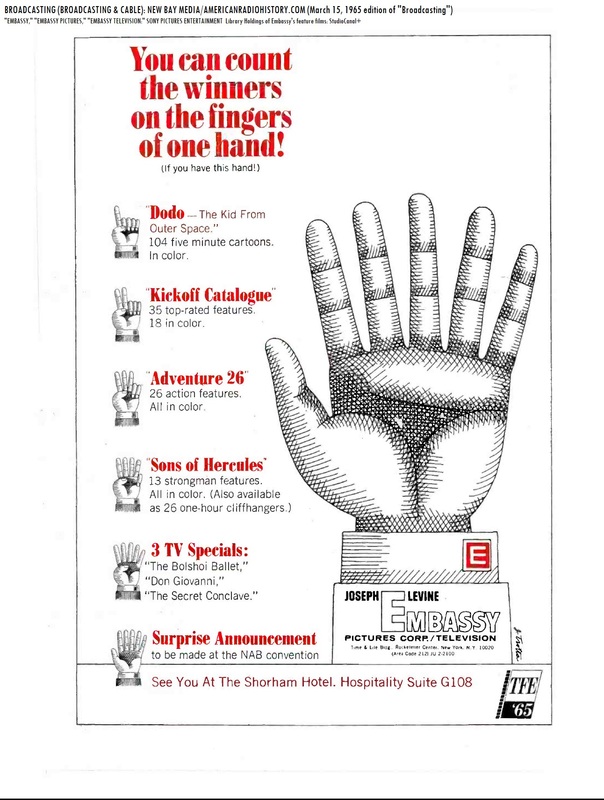 1965 advertisement for Embassy Pictures’ television syndication offerings, including the “Sons of Hercules” package (featuring “The Medusa against the Sons of Hercules“). This was part of a package of dubbed “Hercules” films that was syndicated by Embassy for local television syndication, titled the “Sons of Hercules” package. According to the ad for Embassy’s syndicated offerings for TV that was featured in the March 15, 1965 issue of “Broadcasting” (“Broadcasting and Cable”) magazine, 13 dubbed features were included in the “Sons of Hercules” collection and were also condensed into 26 hour-long programs for local stations. No, that’s not Richard Harrison. That’s Steve Reeves in “Hercules” (1958, which was dubbed by Joseph E. Levine‘s Embassy Pictures for theatrical release and was syndicated to TV by Levine’s Embassy in 1963). 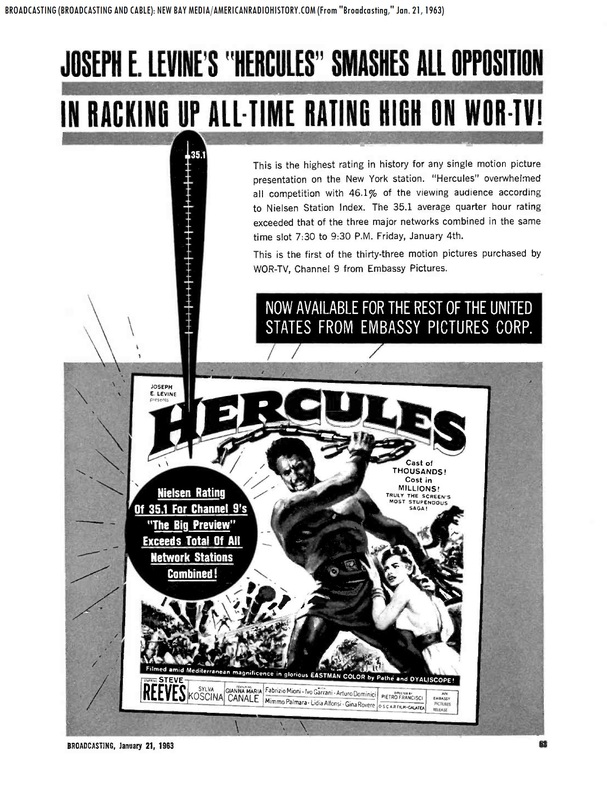 This might have been done to capitalize on the television success of Pietro Francisci’s “Hercules” (1958, featuring Steve Reeves in the title role; Levine handled the North American theatrical rights to the sword-and-sandal feature, Embassy syndicated Francisci’s “Hercules” to local television stations in 1963). “Hercules” (1958) was later riffed on “Mystery Science Theater 3000” with Joel Hodgson in 1993. Be sure to watch and/or record Svengoolie and the return of “The Medusa against the Son of Hercules” (1963), this Sat. on Me-TV! The mighty Svengoolie (portrayed by Rich Koz) and the mighty Kerwyn are ready for this Sat.! Don’t miss out on the fun with Sven, Doug (with his parody song) and Kerwyn (with his “mail call” segment) during Svengoolie’s showcase of the return of “The Medusa against the Son of Hercules” (1963), this Sat. on Me-TV! You will not be disappointed! Highly recommended to all fellow SvenPals! If you missed out on Sven’s Sept. 2017 showcase of “The Medusa against the Son of Hercules” on Me-TV, you will have another chance to witness his showcase of a cult “sword-and-sandal” creature feature! -C.H. Join in on the fun and live-tweet (via Twitter) with all fellow SvenPals out there during #Svengoolie’s Me-TV Sat. 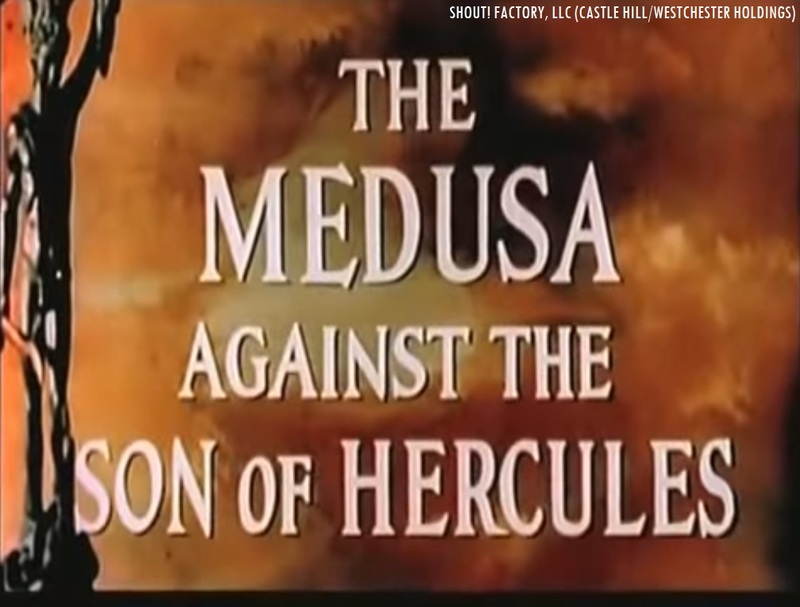 showcase of the return of “The Medusa against the Son of Hercules” (1963)! 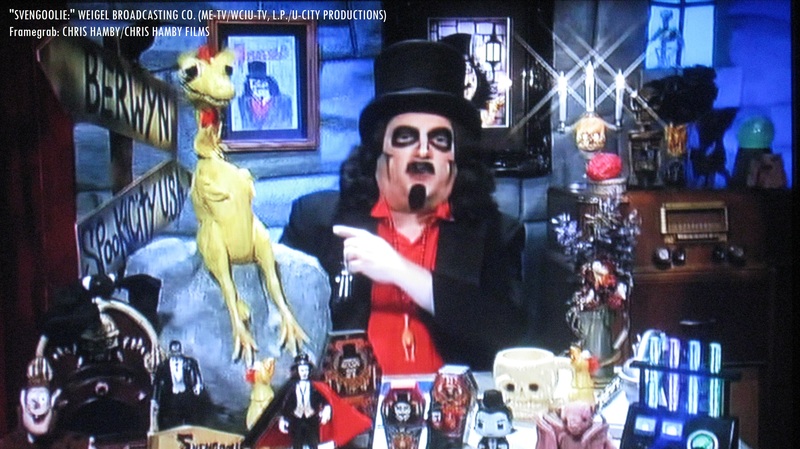 Svengoolie’s recent cameo appearance in the Sunday funnies! 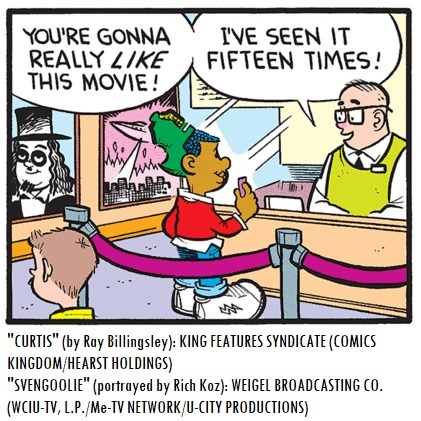 According to Sven’s official Twitter feed, he asked his fellow SvenPals to check out the July 1 edition of Ray Billingsley’s King Features comic strip, “Curtis.” Several fellow SvenPals have confirmed that the man in the movie poster was definitely Sven! Congratulations, Sven on behalf of all of us fellow SvenPals on the cameo appearance in Ray Billingsley’s “Curtis!” -C.H. On behalf of all fellow Svengoolie SvenPals and fellow MSTies of MST3K, the writer of “Silver Screen Reflections” would like to extend get-well greetings to fellow SvenPal/MSTie Chris A. Filippone. Glad to hear you’re back on the airlanes! Get well soon, sir! -C.H. A “Silver Screen Reflections” “flashback” post on Svengoolie’s primetime premiere of “The Medusa Against the Son of Hercules” (1963) from Sept. 2017! “Medusa against the Son of Hercules” is also available to watch for free on Shout! Factory TV (Note: there are digital image artifact problems during the first few seconds of the feature). Questions/comments about “Svengoolie” and/or the return of “The Medusa against the Son of Hercules” (1963)? Drop a line at the comments section!